(Newser) – President Trump made an ominous remark after meeting with his top military commanders—and declined to explain what he was talking about. "You guys know what this represents?" 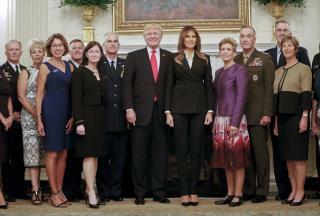 Trump told reporters as he posed for a photo with First Lady Melania Trump, military officials, and their spouses before a White House dinner Thursday night. "Maybe it's the calm before the storm." When asked to clarify the remark, Trump said "we have the world's great military people" present, CBS reports. Asked again what the "storm" might be, Trump said: "You'll find out" and ended the questioning. Next on Newser: So What's on That Note Left by Vegas Shooter?